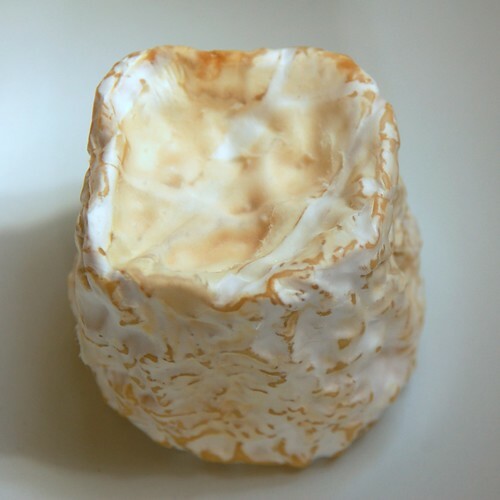 Holy Goat was the subject of my first cheese post so I thought it might be time to return and highlight another cheese from their range - the intriguingly named Pandora. You'll find upon opening this Pandora, that only good things lie inside. 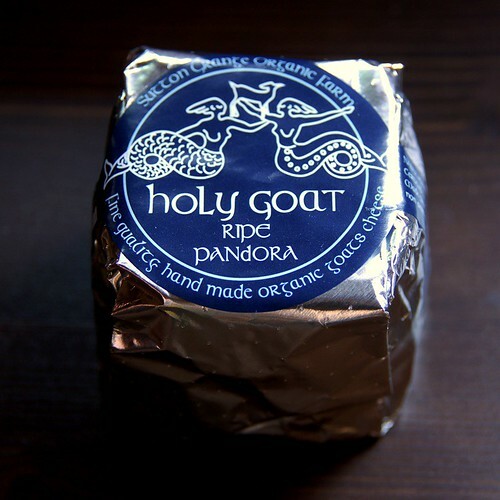 As mentioned previously, Holy Goat is located at Sutton Grange, in central Victoria around Bendigo, at the foothills of Mount Alexander. It's an organic farm and the milk is obtained solely from their own goat herd which is a cross of British Alpine and Swiss Saanen goats. 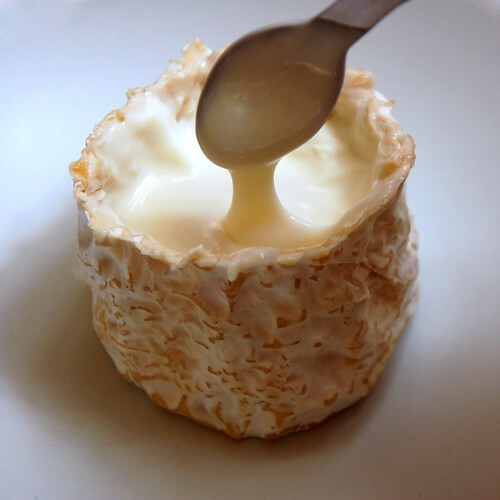 The cheese is made using traditional farmhouse techniques and based on French soft curd styles. Once you pick up the packet you'll immediately notice quite a bit of give - an almost jelly like sensation. 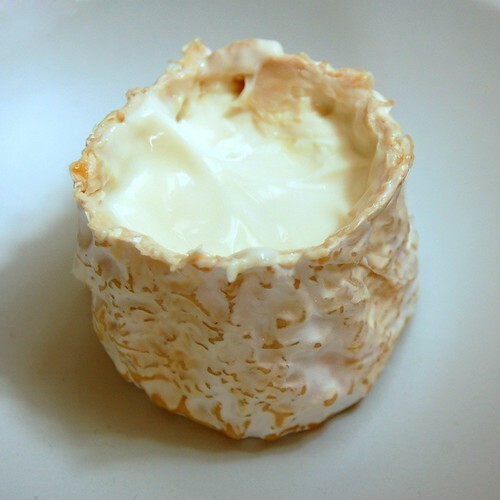 It's very similar in feel to the Udder Delights Goat Camembert. Once removed from it's silver wrapper, it looks quite normal - but looks in this case are deceiving. There is only one way to eat this cheese. Whatever you do - don't approach it like a regular cheese. To get inside, you must cut out a lid - simply run the knife around the top edge to reveal the contents. You do not eat the rind - it's merely the vessel that contains the gloriously viscous cheese that you spoon out and savour. 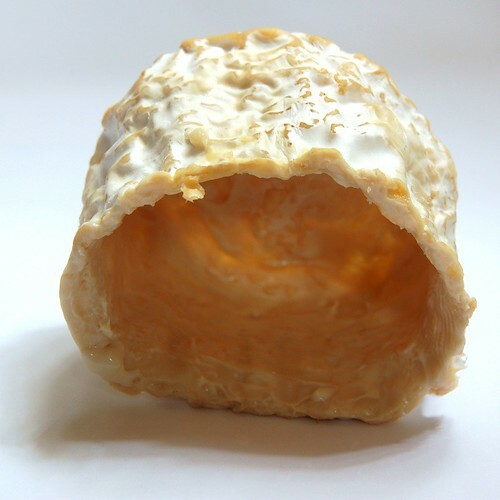 Creamy, without any of those bitter goat elements, rich without being cloying, it's a cheese you can enjoy without any feelings of bloating. You just might find yourself scraping the sides to ensure you've garnered every morsel.